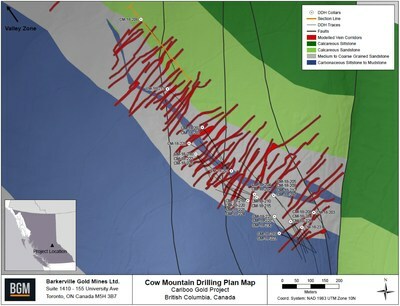 TORONTO, Jan. 23, 2019 /CNW/ - Barkerville Gold Mines Ltd. (TSXV: BGM) (the "Company" or "Barkerville") is pleased to announce the final drilling results from the 2018 Cow Mountain exploration and category conversion program at the Company's flagship Cariboo Gold Project. A total of 63,970 meters were drilled in 231 holes on Cow Mountain during the 2018 drill program and demonstrated continuity of high-grade gold mineralization within vein corridors and extensions down dip and down plunge. 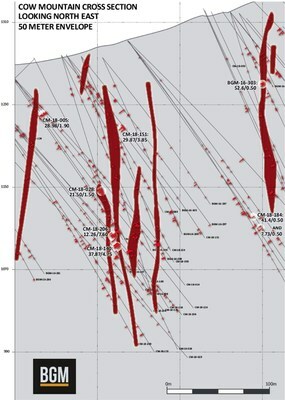 Recent highlights from the Cow Mountain exploration and delineation program include 12.26 g/t Au over 7.60 meters in hole CM-18-206 including high-grade intercept of 97.8 g/t Au over 0.80 meter, located 15 meters up dip of hole CM-18-140 that intersected 37.87 g/t Au over 4.75 meters. The Company is currently working on an updated model to include the additional 231 holes. 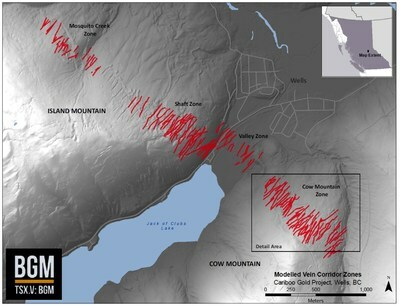 The drill program at Cow Mountain was designed to infill and expand high-grade gold-mineralized vein corridors modelled in the May 2018 Cow Mountain resource estimate. Vein corridors are defined as a high-density network of mineralized quartz veins within the sandstones. Mineralized quartz veins on the Cariboo Gold Project are overall sub-vertical dip and northeast strike. These corridors have been defined from surface to a vertical depth of up to 300 meters and remain open for expansion at depth and down plunge. Gold grades are intimately associated with vein-hosted pyrite as well as pyritic, intensely silicified wall rock haloes in close proximity to the veins. The Company is focused on developing its extensive mineral rights package located in the historical Cariboo Mining District of central British Columbia. Barkerville's Cariboo Gold Project mineral tenures cover 1,950 square kilometres; along a strike length of 67 kilometres which includes several past producing placer and hard rock mines, making it one of the most well-endowed land packages in British Columbia. Since the management change in mid-2015, the Company has unlocked the fundamental structural controls of gold mineralization. The Company's Brownfield's exploration team is focused on upgrading and expanding the May 2018 43-101 compliant resource within the 8 kilometers of principle project area located near the town of Wells, British Columbia. The Company's Greenfield's team is developing quality exploration assets throughout the remaining land package through systematic, scientific, exploration. The operation's team is focused on completing required studies in order to pemit underground mining on Cow and Island Mountains.